High-visibility orange-and-white reflective tape is meant to help ensure that riders do not mistake the space between cars for an open door. The agency, however, still does not expect to meet a federally imposed deadline to add chain-link barriers by year's end. WASHINGTON — Metro is making additional changes to its new trains after at least two visually impaired people fell through the space between cars onto the tracks, but the agency still does not expect to meet an FTA-imposed deadline to complete fixes by the end of this year. 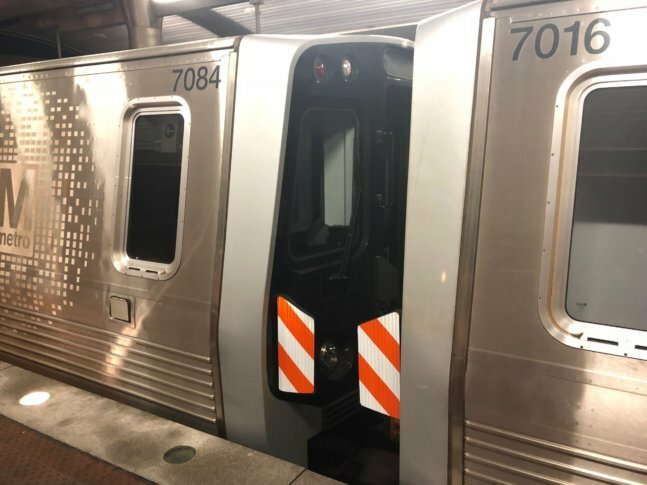 The latest temporary safety improvement is new high-visibility orange-and-white reflective tape that Metro expects to have on all rubber barriers between 7000 Series cars within a few weeks. Since the Federal Transit Administration renewed concerns in June, Metro has also added announcements before doors open that “this is a 7000 Series train,” and it has begun two other safety announcements in stations urging visually impaired riders to tap the floor of the railcar with their canes before stepping off the platform edge. The automated “this is a 7000 Series train” announcement is temporary, and will end when chain-link barriers are installed on all of the new railcars, Metro officials told the FTA. Each of the changes is meant to help ensure that riders who are familiar with the Metro system do not mistake the space between cars for an open door. On all of Metro’s older trainsets, chain-link barriers are used to block that space. On the new trains, the chain link barriers are only used every other car, with rubber barriers in the alternate spaces. The rubber barriers were used and kept in place despite concerns about inconsistency from Metro’s accessibility advisory panel. The goal of the change to rubber barriers had been to address worker safety concerns and the additional time it takes to connect and disconnect the chain-link barriers in rail yards when pairs of cars are rearranged into new trainsets. At least two riders have fallen through the space between cars onto the tracks. The FTA said it is reviewing the latest updates Metro provided Friday in response to a searing follow-up the agency sent Metro earlier last week. In that letter, FTA’s acting associate administrator Henrika Buchanan chided Metro for its initial plan. “The work plan … is incomplete and does not provide sufficient detail about WMATA’s strategies for mitigating the risk to passengers and the current project schedule,” she wrote. The timeline to install chain-link barriers on all gaps between 7000 Series cars has shifted several times, but Metro told the FTA in a letter sent Friday that the fixes could now be done by May. While that is still months after an FTA deadline of the end of the year, it is significantly sooner than the November 2019 date Metro had set last month. “At this time we do not expect to meet the FTA imposed deadline of ‘no later than December 31, 2018’ and would like to emphasize that if the FTA chooses to exercise its authority to withhold funding, we believe this action would be counterproductive to safety and operational performance,” Metro Chief Safety Officer Pat Lavin wrote to the FTA. Last month, in a first response to the federal mandate, Lavin threatened that Metro would need to cut rush-hour service to comply, because so many cars would not be allowed on the tracks. In last week’s response to Metro, the FTA said it had no plans to bar 7000 Series trains from running in the system if repairs are not completed. “[M]y June 22, 2018 letter did not, contrary to the misstatement in your June 29, 2018 letter, contain an ultimatum to ground WMATA’s 700-series railcars,” Buchanan wrote. “Rather, my letter directed WMATA to prepare and submit a work plan addressing four specific actions and noted FTA’s authority to withhold funds if WMATA failed to comply with those required actions,” she said. The upgrade work will be done by the railcar manufacturer, Kawasaki. In a letter to Metro dated July 19, the company said the lengthy timeline is due in part to a long lead time for a bracket assembly used to connect the chains as well as a lengthy polishing process for painting. Overall, the company now says that once design specifications are confirmed, it will take 10 months to install the new barriers on all 748 of the 7000 Series railcars that Metro will eventually own. Only the last 50 of the cars will arrive with the new chain-link barriers already installed at the Nebraska manufacturing plant. Other cars that have arrived or are scheduled to arrive in the coming months at Metro are scheduled to get the fixes in the D.C. area before going into service. New car deliveries have been delayed recently. “We put a recommendation in three years ago, and we had someone fall between the car doors as recently as June,” Sheehan said. He supports the FTA mandate for fixes by December, in part because Metro had already committed in 2016 to make the changes by the end of 2017 at the latest. Metro maintains the existing barriers do meet all legal requirements, especially because other transit systems have no barriers between cars or variation across different trains. Metro’s June letter to the FTA also questioned whether one man who said he fell onto the tracks in 2016 really did. The agency has still agreed to make the changes to keep the system consistent for visually impaired riders.